So I’ve had a bit of a feast of picture books recently. I know we’ve bought too many when my children can’t get them out of the bookcase because they’re rammed too tightly. This one, however, never gets put away, so it’s available to read every day. The front cover sums up the story – a disgruntled Mouse gets angrier and angrier when a Bear won’t get off his chair. For anyone who’s ever witnessed children squabbling over a seat (hehemm *pretty much every day*), this is hilarious for parent and child alike, and also teaches a little bit of a lesson. Sometimes it’s hard to work out what makes a picture book stand out from the rest. This one ticks many boxes. The illustrations start to work and tell the story even from the title page. Then, as has been spoken about a lot recently, the pictures themselves tell the story as much as the text – the two work perfectly in conjunction with each other – if you isolated either text or pictures, it wouldn’t be enough to tell the whole story. I love the complacent and slightly bemused look on the bear’s face, and the mouse’s expression – betraying unhappiness, disgruntlement, anger, impatience – so much in such a cute face. Even his jumper gives him a distinct personality. The children loved the different things the Bear got up to in his chair, from reading the newspaper to preening himself in the mirror, to reclining half asleep, to looking determinedly at his phone and ignoring the mouse (“my Dad does that” said one of the kids I read it to!). The mouse is also a delight to look at – getting angrier and angrier – and then more disconsolate when the bear won’t budge. The text is a joy to read – and reminded me hugely of Dr Seuss – yes the rhymes and rhythms are that perfect. 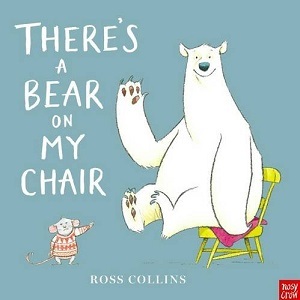 The entire book concentrates on rhyming with ‘bear’, so that the mouse has to ‘declare’ about it not being ‘fair’, the bear on his ‘chair’, with references to ‘underwear’, and ‘hair’ and ‘flair’. It’s magical. And the ending is pure comedy. I loved it – buy it from your local independent bookseller. Or here, from Waterstones, or on the Amazon sidebar. With thanks to Nosy Crow for sending me a review copy.